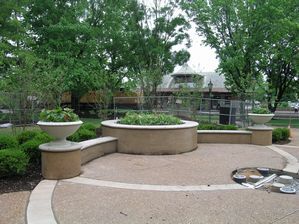 The 2009-10 renovation of Reim Plaza at Kirkwood City Hall included the addition of a pair of Glencoe planter urns and a featured circular landscape planter. Kirkwood in BLOOM assists with planting design and plant procurement coordination to embellish the three seasonal color planters. The new Reim Plaza designed by St. Louis-based Planning Design Studio, a professional landscape architecture design firm.